I am pleased to announce the launch of http://www.tuningdrones.com/. This site replaces my old “Bone Drones” recordings with a fully customizable solution. In addition to selecting any pitch in any octave, this drone can also play octaves, fifths, and major or minor triads – in either equal temperament or just intonation. The app includes 14 different timbres to choose from, including all orchestral instruments as well as euphonium. The current market for drone tones is active; everyone (including myself) has a favored set of pre-recorded drones that blend well with a certain instrument in a certain musical context. Each of these drone sets is excellent for its individual circumstances, but they all have the same shortcomings. To get an indefinite duration of the drone, a recording must repeat, which creates a very distracting hiccup in the middle of the sound. The sounds themselves are limited to the original bundle. If you need a pre-recorded drone an octave lower or with an equal-tempered third on top, for instance, you’re out of luck. Tuningdrones.com takes care of all such issues by generating the audio on demand. Any modifications to the sound are as easy as selecting a different option. Hello Mr Coy! 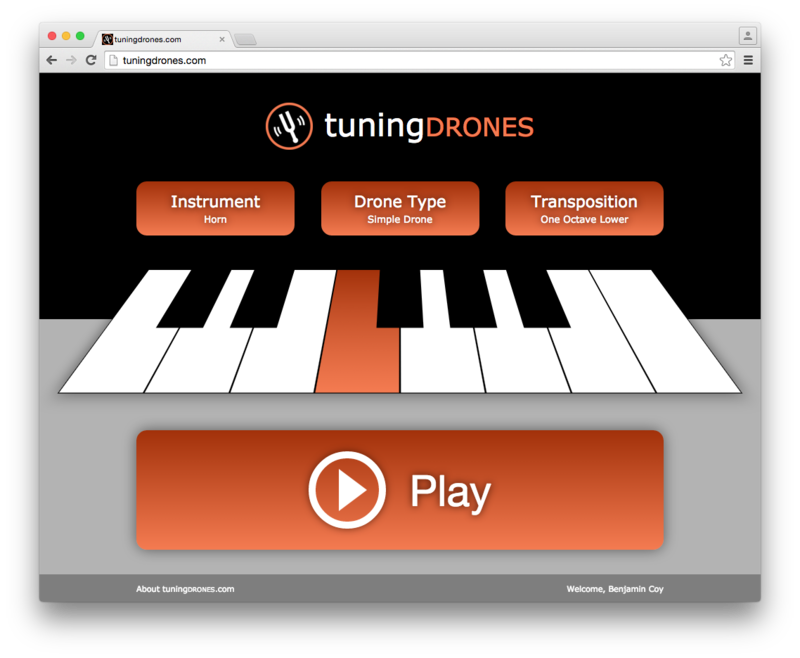 I find the idea of establishing an online tunerdrone just fascinating! Well, I tried to play the Bone Drone, but it simply refuse to start. Can you, please, help me with this issue?! My best guess is that your browser isn’t compatible. Use a recent release of Chrome, Safari, or Firefox. Internet Explorer does not have the capability, and only the latest Android version works. Ooo, I forgot to tell you what system I use. It`s Windows 7 Pc and the browser is Chrome. I didn`t try it on Android yet. Thank you for your quick answer. My best guess is that you’re using an older version of Chrome that uses a deprecated function set. I’ve added this older code in; let me know if you see any improvement?